Image: Dairy Farmer Geoff Hutchinson with his newly installed automated dairy. Image from The Stock Journal. A newly installed parlour-style dairy has helped farmer Geoff Hutchinson to improve the profitability and productivity of his Fleurieu Peninsula dairy farm. For many dairy farmers across Australia, innovation and progress are essential ingredients to remain sustainable in such a complex and volatile sector of the industry. 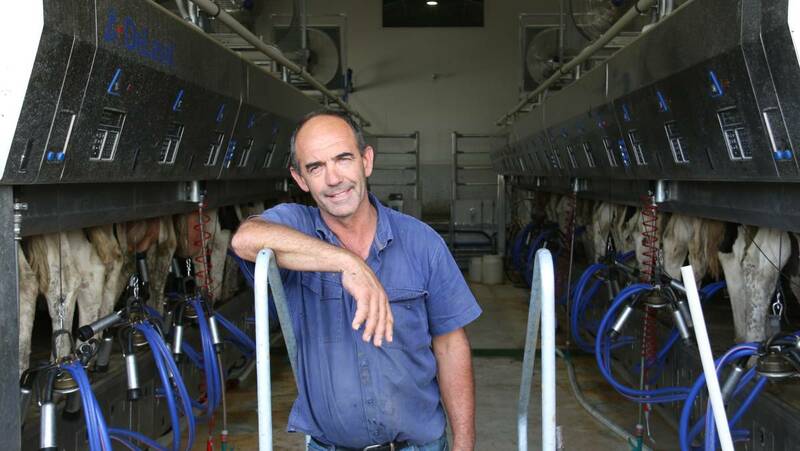 In Myponga on the Fleurieu Peninsula in South Australia, the move to a modern milking system has helped farmer Geoff Hutchinson stay ahead of the curve by improving daily operations, as well as increasing the well being of his herd. The new dairy is a DeLaval P2100 Parallel Parlour, currently able to milk 30 cows at any one time with the capacity to increase that number to 36. The increased capacity will allow Mr Hutchinson to increase his herd from 200 to 240 Holstein cows. On top of the added capacity, the new system is able to trickle feed grain to cows while they are milked. Feed rations are formulated to suit each animal’s production and lactation requirements, triggered by the electronic ID tag in each animal’s ear. ‘Anything giving over 20 litres a day gets nine kilograms of grain and then it’s averaged down for the cows giving less or getting closer to drying off,’ said Mr Hutchinson. Steadying the flow of grain has meant less waste and mess and seemingly happier cows. ‘They just sit there and chow down on grain and are very happy’. ‘Output’ is also dealt with more effectively, with a gutter collecting manure before an auto flush system removes it. Along with an auto-draft and electronic ID systems, the new set up has halved milking times from four to two hours per shift, meaning more time at pasture for the cows and an increase in employee productivity. As a part owner of the Fleurieu Milk Company, milk produced on Mr Hutchinson’s farm is transported to a nearby factory to be used in milk and yoghurt products. The company was started by Mr Hutchinson and two farming neighbours in 2003 as a way to improve the profitability and viability of their farms. Now offering a range of milk, flavoured milk, cream and yoghurts, the brand focuses on the direct-from-the-farmer message to appeal to consumers. The short physical distance between supplying dairies and the factory provides the Fleurieu Milk Company with a key point of difference from its competitors, alongside the un-homogenised products and farmer-friendly brand. Sources: The Stock Journal, Fleurieu Milk Co.